His love affair with the guitar began when less than ten years old as he used his dad’s nylon string acoustic guitar to play along with AC/DC on his boom box. At thirteen, he played his first professional gig in his older brother’s band at the Masquerade, where as an unexpected underage guitarist he had to be escorted on and off stage. He played and recorded original music throughout high school and college. The lure of music called him and he set his sights on making it somehow in music. While he worked on his own original music, he landed a job at Avatar Productions managing backline equipment at concerts and festivals, his strong knowledge of sound gear giving him confidence and quick success. He also got to watch and learn from the guitar techs touring with the bands he supported, and he saw he could stay connected to his passion for music in other professional capacities. A Google search led him to an intensive course in guitar building and repair, and Tomás began immersing himself to become a luthier, work he learned he truly loved and for which he had a natural knack. For a year after graduating from the program, he would drive into the city, pick up guitars from customers referred through his network, work on the guitars until early morning, and deliver them the next day after he finished working his day job. He subsequently found a position with an area guitar repair shop and while it was steady income, it was there that he began to develop his vision for disrupting the traditional luthier business. 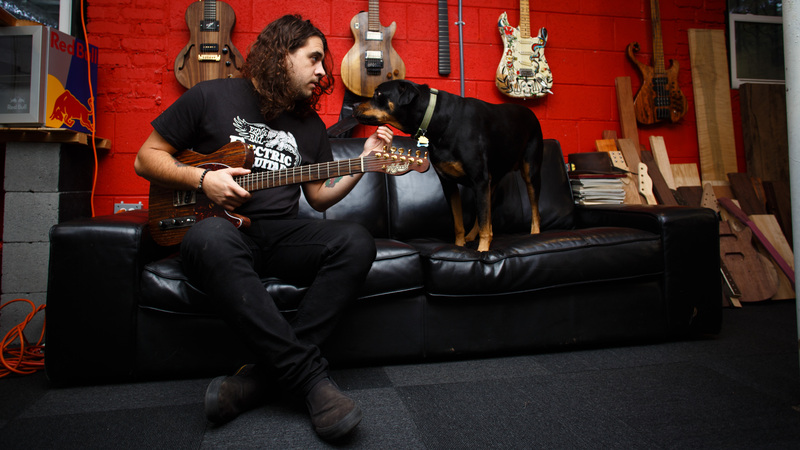 In the traditional model, Tomás says “Customers had to drop off their guitars and we were not returning them for as long as two weeks or more. That is a long time to go without an instrument. I realized that what mattered to me was taking care of musicians who work with their instruments and for whom their instruments are part of their lives and livelihoods, not only the collector fan. I want to take care of students learning, people who play at home – but people who really play and for whom I can make a difference. 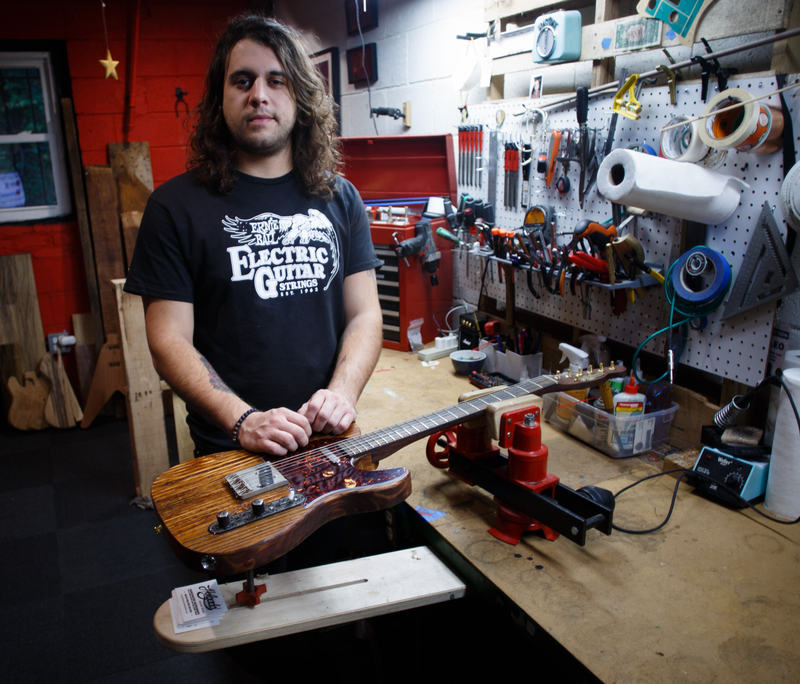 I saw that the traditional business model was dismissing some of these very customers, and at that point this passion was starting to feel like work and I was again feeling trapped.” He wanted to be a luthier, but he wanted to do things differently. Using appointments to structure his time has allowed him to also focus on custom guitar building, a side of his business he wants to grow. He has his own aesthetic direction for his instruments. A sample of some builds in progress. Note the dog inlay on the fingerboard. 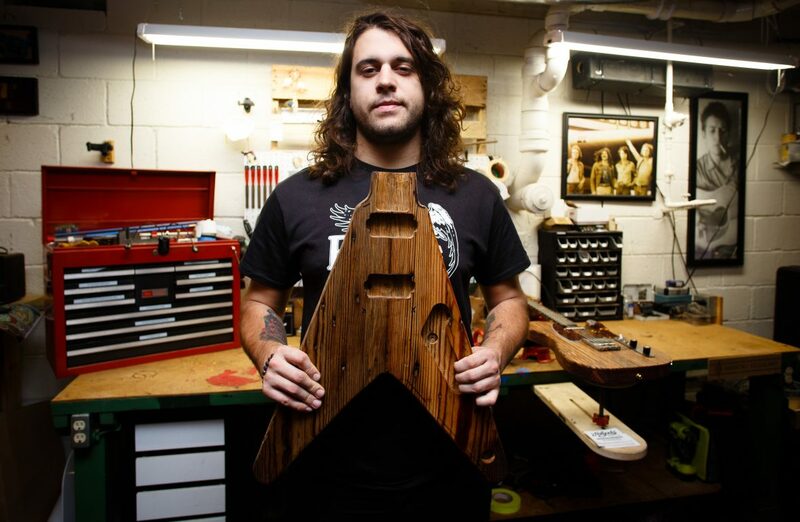 Because of his love of the beauty of the wood, Tomás is now building a series of handmade guitars from what he calls “legendary lumber.” In this case, it is wood from the original Masquerade club, where Tomás played his first gig. “Much of the wood is 110-plus year-old cedar and pine, and not only is it beautiful, but the wood has dried naturally in ideal conditions – not to mention that it reverberates with Atlanta music history.” Tomás is taking advance orders on these guitars now. He has sourced additional historic wood, some dating to the 1800’s, from former restaurants, inns, and buildings in places around the region. 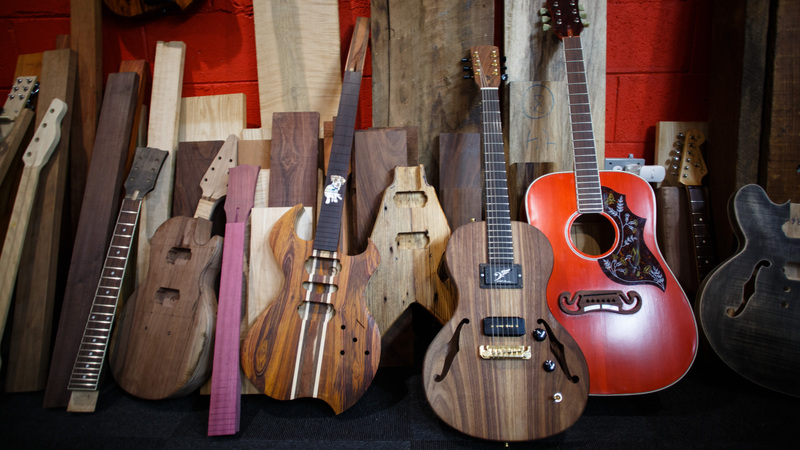 Holgado Guitar Works has a friendly vibe and is a comfortable place to hang out while waiting for your guitar. Expect to see puppy Georgia while you are there.